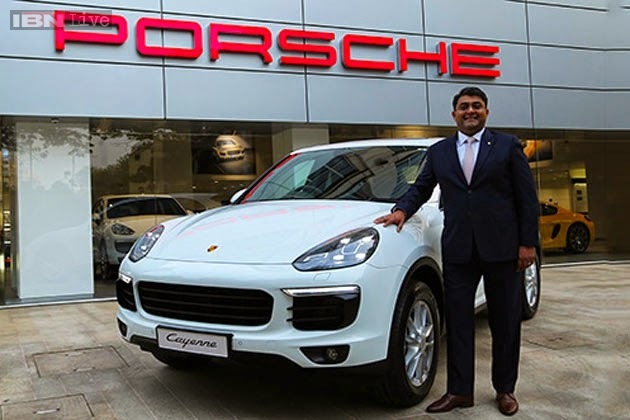 Porsche India has launched the refreshed Cayenne SUV in India with price starting from Rs. 1.02 crores. The refreshed Cayenne SUV features minor cosmetic and mechanical changes. The new Cayenne is available in four variants – Cayenne Diesel, Cayenne S Diesel, Cayenne S and Cayenne Turbo. The exterior changes come in the form of new headlamps and taillamps, inspired from the Macan SUV. The front end gets newly shaped bonnet, bumper and airdam. In the rear there is better integration of number plate enclosure and boot handle added with new exhaust pipers. Interiors see changes with 918 inspired steering wheel with paddle sifters. The new Cayenne gets four zone climate control, a panoramic roof and an optional rear seat ventilation system. There is addition of Porsche Active Suspension Management, Porsche Entry and Drive in the new Porsche Cayenne 2015. Powering the new Cayenne diesel is the 3.0L V6 diesel with 245 hp of power and 550 nm of torque. Cayenne S diesel gets a 4.2L V8 engine. Cayenne S now uses Macan’s 3.6L twin turbo V6 petrol with 420 hp of power and 550 Nm of torque. Cayenne Turbo continues with its 4.8L bi-turbo V8 petrol engine.